Mexican officials are now saying the shootout that killed seven people in a suburb of Mexico City last weekend was the result of a dispute between gangs tied to the La Familia Michoacana, a cult-like drug cartel known for its ultra-violent tactics. The AP reports that Mexico state Attorney General Alfredo Castillo has attributed the attack to La Familia and said the cartel has been trying to expand into Mexico City’s environs. This is the first time Mexican authorities have linked a major cartel with any of the recent attacks around Mexico City. Until recently, the capital has largely been spared from the drug-related violence that has ravaged other parts of the country since 2006. Last weekend’s attacks comes as the federal government claims La Familia is in retreat. 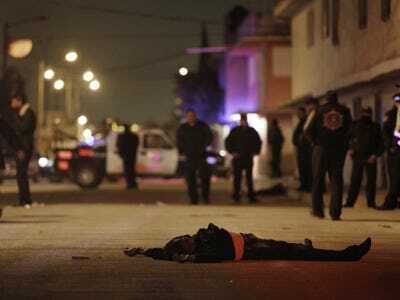 The cartel has suffered major setbacks since the death of its boss and spiritual leader in December. La Familia formerly declared it was disbanding last month, but many believe the cartel is simply lying low while it reorganizes and forms new alliances. The recent spike in violence around Mexico’s Federal District has raised concerns that the capital city could become a new flashpoint for cartel violence, Stratfor says. As recreational drug use increases domestically, Mexico City is an increasingly attractive target for weakened cartels that rely on the retail drug trade.